NBA Live 16 is now available in The Vault, a library of games that is available to Xbox One users who have an EA Access subscription. If you’re on Xbox One and you have an active EA Access subscription, now is your chance to check out NBA Live 16 if you haven’t already. For those who are unaware, EA Access is a subscription service that costs $4.99 US per month, and includes early access to games, an instant game collection as new titles are added to its library (“The Vault”), and a 10% discount on digital purchases from EA, including full games, pre-orders, and downloadable content. There is no equivalent program for PlayStation 4 users, as EA Access is a partnership between EA and Microsoft, but the NBA Live 16 demo is still available to download from the PlayStation Store. It includes access to LIVE Pro-Am, and allows you to level your player up to an 80 Overall, which carries over to the full game if you decide to pick it up. 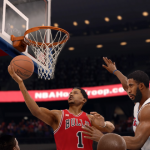 If you do use EA Access to give NBA Live 16 a try, we of course invite you to share your impressions and join in the discussion here in the NLSC Forum! We’d also welcome your contributions to the NBA Live 17 Wishlist, which you can find in this thread.